On March 24, 1989, the Exxon Valdez tanker ran aground on Bligh Reef, spilling at least 11 million gallons of crude oil into Prince William Sound. The Legislature took swift action, approving a number of bills related to the incident. Among these were measures authorizing the Attorney General to bring legal action seeking compensation for any damages caused by the spill, the establishment of a commission to investigate the disaster and suggest steps to avoid future accidents, and a special appropriation of up to $20 million, made within days of the spill, to fund the State's response. These were only the initial steps, however, in what would become a decades long struggle for the State and its people in dealing with the impacts of the spill. 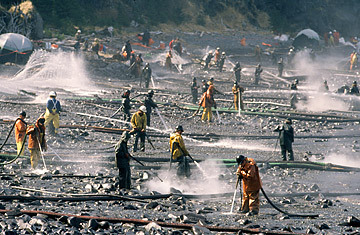 Although the oil spill was a major topic driving the latter half of the 1989 session, the 16th Legislature considered a variety of other issues. Public land was set aside in an expansion of parks and the establishment of critical habitat areas and game refuges. The Alaska Whistleblower Act was approved, providing protection to public employees who report mismanagement or legal violations in government. All of these actions occurred following a year in which North Slope crude oil prices dropped to under $10 per barrel-a decrease of roughly 40 percent below the previous year's average price. Among the measures taken to reduce the cost of government was an incentive program to encourage higher paid state employees to retire. A decision by the Alaska Supreme Court throwing out the state's rural preference for subsistence hunting placed the state at odds with federal law and rekindled long-running conflicts among user groups. The Legislature held a special session to resolve the issue in 1990-with many more to come in future years-but ultimately failed, leading to a federal takeover of subsistence management on federal lands in the state. Alaska voters approved an initiative to recriminalize marijuana possession, which had been made legal by the decision of the state Supreme Court in the 1975 Ravin case. Ultimately, the ballot measure was found unconstitutional in Noy v. State. Congress approves the Tongass Reform Act adding one million acres to the national forest and setting aside 300,000 acres of that as wilderness, protecting old growth timber but dramatically impacting the logging industry in the region. A British engineer and computer scientist named Tim Berners-Lee and his colleagues propose a system to provide electronic access to inter-linked information of various kinds that users can browse at will. They name the system the "World Wide Web." In August 1990, Iraq invades Kuwait, ultimately leading to military action by the U.S. and allies to repel Saddam Hussein's forces. Oil prices briefly double as a result.